I feel for this pair of siblings. This young boy was protecting his little brother (or sister..as i can't tell) by shielding him using his body. And this little baby brother was so comfortably sleeping on his thighs. The boy was so tired. And he dozed off. But if you move near him, he would be so alert and straight away shielding his brother with his shirt and cover his own face with his hand. He has such shame in him and perhaps he did not want his little brother to be exposed to the same guilt and shame. I feel so sad for him. He is my hero who sacrificed for his brother. Anyway, I walked towards him and gave him a pat on the shoulder and stroke his dirty hair. It was a gesture of telling him I care and I appreciated his care for his brother. Abject Poverty. The picture above explains and illustrates it for you. Abject poverty is wretched, miserable, hopeless, pitiful, pitiable, woeful, degrading, appalling, groveling, shameful, scandalous, embarrassing, humiliating deprivation. Look at the maps below. You will see where abject poverty lives and feeds on this planet. It dresses in brilliant oranges, rusts, deepest browns, and yellow. Its presence is entrenched like a specter over a graveyard across three continents. People born beneath it's skirts are rapaciously hunted and eaten by it every day. The lovely yellow train that veils it's ugly face falls back across most of South America. But it takes its mighty stand like a god on top of western and southern Africa where its robes morph to near black like necrotizing gangrene. The sleeve of its long arm drapes across the Muslim world, and then it's powerful fist seizes South Asia by the neck where it strangles millions. Finally, in one last effort, it extends it's long finger out into the Pacific Ocean and touches the Philippines, infecting it's farthest shores with misery until it mercifully runs out of humanity when it meets endles water. 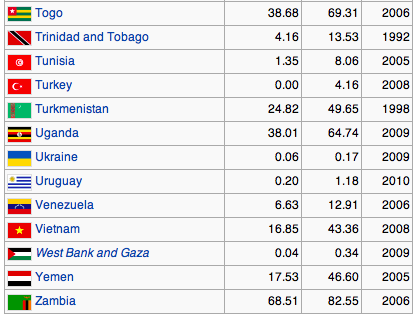 The poorest countries in the world. But look closely what is lying just under abject poverty safely out of reach. Do you see what is high on the map up in the cold north? Find the gorgeous beaches and islands of the Mediterranean. Observe what flows up into those blessed industrial nations. Notice especially who is separated from those mixed autumn colors by the two largest oceans in the world - as far as they can get from abject poverty. These are the people who bask in the beautiful color of royal BLUE. The richest countries of the world. After you have looked at these maps, watch the video below - "Wealth Inequality In America" - about a nice BLUE country. When you see who the super rich are in the United States, take the blue countries on these maps and put them in the place of the super rich on this planet as compared to the reds, maroons, dark browns, and autumn colors. Map of world poverty by country, showing percentage of population living on less than $2 per day. 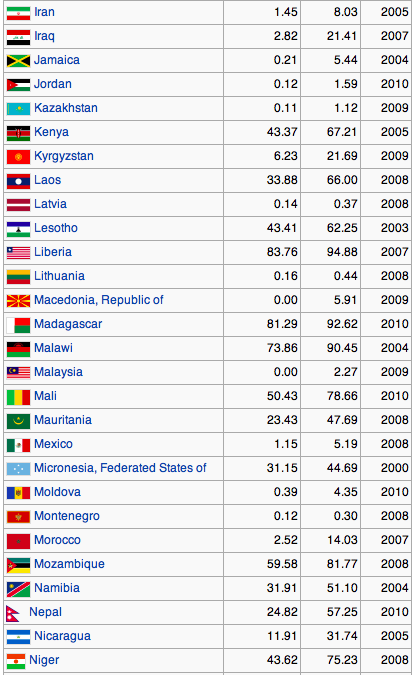 Based on the 2009 UN Human Development Report. Map of world poverty by country, showing percentage of population living below the national poverty line. Based on data from the CIA World Factbook. Not all figures are up to date. Christian mission organizations often speak of the 10/40 window, as in the map below. The 10/40 Window is home to the majority of the world's unevangelized countries. The "unevangelized" are people who have a minimal knowledge of the gospel, but have no valid opportunity to respond to it. While it constitutes only one-third of earth's total land area, nearly two-thirds of the world's people reside in the 10/40 Window, containing four of the world's dominant religious blocs. The majority of the followers of Islam, Hinduism, and Buddhism as well as the Non-Religious block live within the 10/40 Window. 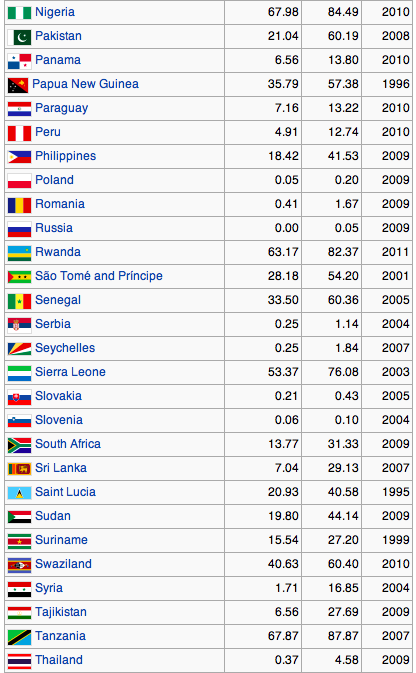 Notice that the 10/40 Window is also home to the majority of the world's poor. Of the poorest of the poor, more than eight out of ten live in the 10/40 Window. On average, they exist on less than a few hundred dollars per person per year. It has been said that "the poor are the lost, and the lost are the poor" as the majority of the unreached live in the poorest countries of the world. There is a remarkable overlap between the poorest countries of the world and those that are least evangelized. 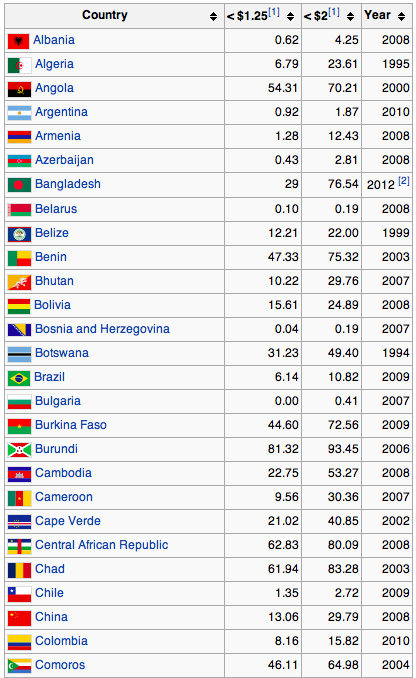 The table below refers to the lists of countries by the percentage of their population with an income of less than 1.25 (the first column), and less than 2 US dollars per day (the second column). 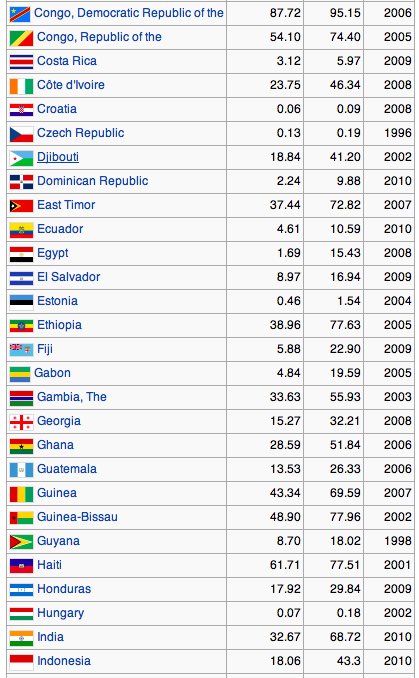 The sourced data refers to the most recent year available during the period 1992-2011.